Tara sent in this intriguing and well-formatted ad from Ontario's motor city. 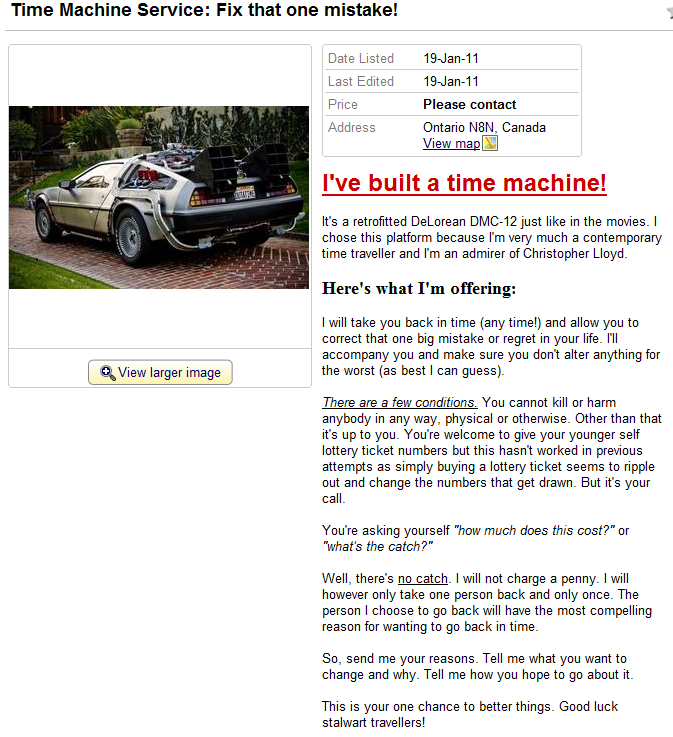 I've built a time machine! It's a retrofitted DeLorean DMC-12 just like in the movies. I chose this platform because I'm very much a contemporary time traveller and I'm an admirer of Christopher Lloyd. I will take you back in time (any time!) and allow you to correct that one big mistake or regret in your life. I'll accompany you and make sure you don't alter anything for the worst (as best I can guess). There are a few conditions. You cannot kill or harm anybody in any way, physical or otherwise. Other than that it's up to you. You're welcome to give your younger self lottery ticket numbers but this hasn't worked in previous attempts as simply buying a lottery ticket seems to ripple out and change the numbers that get drawn. But it's your call. You're asking yourself "how much does this cost?" or "what's the catch?" Well, there's no catch. I will not charge a penny. I will however only take one person back and only once. The person I choose to go back will have the most compelling reason for wanting to go back in time. So, send me your reasons. Tell me what you want to change and why. Tell me how you hope to go about it. This is your one chance to better things. Good luck stalwart travellers!